A review in 10 words (or thereabouts): Don't walk into a fun house alone. Nothing good can happen. Life is almost back to normal for Harper Price. The Ephors have been silent after their deadly attack at Cotillion months ago, and best friend Bee has returned after a mysterious disappearance. Now Harper can return her focus to the important things in life: school, canoodling with David, her nemesis-turned-ward-slash-bofie, and even competing int he Miss Pine Grove pageant. 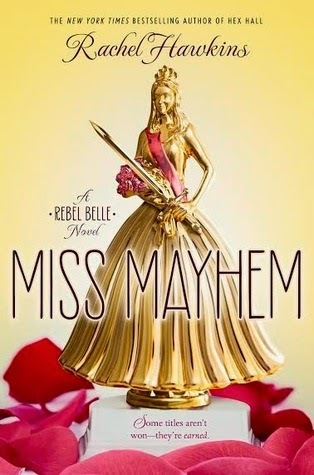 The fun continues the second book of the Rebel Belle series by Rachel Hawkins. I was on the lookout for another audiobook, and this came across my feed. Amy Rubinate reads it with her fantastic southern accent, and I love accents, even southern ones. Or maybe especially southern ones. That's not true. I'm mostly partial to Irish. I'm getting distracted. Okay, so Harper Price is still a paladin, charged with the ancient responsibility of protecting the Oracle, David, her boyfriend. It's a little complicated. But now she's found out that she has to complete a test in order to officially become a paladin. So the ephors still want David, David is still having premonitions about the future, and now her ex, Ryan, is the mage who must work with them to protect the world. It's a silly story, but fun. And sometimes that's all a book needs to be. Fun. Harper is a strong, independent woman who is willing to risk big to save the people she loves the most. David is a confused young man who is trying to understand this huge reality he faces. And Ryan likes to kiss a lot of girls. Yep. Just fun. Maybe not a "must read", but definitely a let your mind go and just be entertained read.